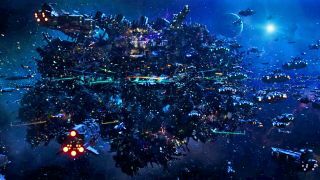 The city of Alpha in Luc Besson's latest fantasy film, "Valerian and the City of a Thousand Planets," shares a few similarities to the existing International Space Station, which is highlighted in the opening scene of the movie. In the new adventure movie "Valerian and the City of a Thousand Planets," directed by Luc Besson, the title city of Alpha has a present-day origin: the International Space Station. The fictional metropolis Alpha was inspired by Point City, which was first written about in the sixth volume of the "Valerian and Laureline" graphic novel series, entitled "Ambassador of the Shadows." The ISS' evolution is a plausible one: The station has a history of bringing cultures together to build itself and to exchange ideas. In "Valerian," the first greeting in the montage takes place in the not-too-distant year 2020, where two human astronauts are shown embracing, and as we advance in time, we see increasingly strange aliens introduce themselves to humans on board the station. Certainly, the international crews that have continuously occupied the existing ISS since 2000 would have milder reactions to meeting foreign astronauts than hypothetically meeting alien life-forms. However, the ISS was nevertheless groundbreaking in its ability to unite five space agencies to expand scientific research possibilities and to mend older nationalistic divisions. Many of the space programs involved with the station — NASA (United States), Roscosmos (Russia), CSA (Canada), JAXA (Japan), ESA (Europe) — include countries that have warred with one another in the last century. This image is a side-by-side view of early space station concepts in fact and fiction. In the decade following these illustrations, the "Valerian and Laureline" comic was written, later inspiring director Luc Besson to create the 2017 "Valerian" film. Early concepts for the ISS had the space station taking the shape of a giant wheel. Wernher von Braun developed an ISS station concept in 1952 that was round in order to provide simulated gravity through rotation, with a capacity to house dozens of scientists, according this Space.com infographic. Science-fiction storytellers were clearly inspired by these concepts, and a few years later, in 1968, Stanley Kubrick's film "2001: A Space Odyssey" developed a model for a space station that was in a similar wheel shape. The year before, 1967, the first issue of "Valerian and Laureline" was published by Dargaud, according to "Valerian" film representatives. Point Central, a vast space station that lies at the crossroads of space that inspired Alpha in the film adaptation, appeared a few years later, in the 1975 comic "Valerian Vol 6: Ambassador of the Shadows." Right now, NASA and U.S. officials have only promised to fund the ISS through 2024, so it's uncertain what the future will hold for the orbiting lab. But as crews from around the world work together to research and live in space, science-fiction writers have inspiration to continue writing tales of the ISS expanding someday into that kind of vibrant metropolis. Mission specialists Lopez-Alegria and Herrington working on a newly installed Port One (P1) truss on the International Space Station in 2002.